Holly Robinson Peete is described often as an actress and singer, both of which are a reference to the work that she does, but rather impressively, she also frequently wears the label of philanthropist showing her attitude to constantly giving back to society as she benefits from it. To know more about this hard-working woman who has made quite a name for herself keep reading below. Holly Robinson Peete was born Holly Elizabeth Robinson on September 18, 1964. Following high school, she attended Sarah Lawrence College in New York where she got a degree in Psychology and French in 1986. She had plans to go to graduate school and apply for work in the U.S. State Department focused on her strength in languages. She decided, however, to try her hand at an acting career and was soon being played in attractive roles in series and films. She is one of the few lucky ones to find a level of success in the film industry and as such her career has seen her play Judy Hoffs on the Fox TV police drama 21 Jump Street. Other prominent roles in which people may remember her are her role as Vanessa Russell on the ABC sitcom Hangin’ with Mr Cooper and also when she played Dr. Malena Ellis on For Your Love, a sitcom which was aired by NBC/WB. Holly did not, however, stick to only acting. She is also an author whose children’s book My Brother Charlie won her the March 2011 NAACP Image Award for Outstanding Literary Work. Earlier in 2006, she won the Quills Award in Sports for the book “Get Your Own Damn Beer, I’m Watching the Game! : A Woman’s Guide to Loving Pro Football” along with fellow writer Daniel Paisner. She also stretched her talent muscles to establish a limited career as a singer/ recording artist. As part of that life, she contributed songs to the soundtrack of the film Howard the Duck and the introductory song to 21 Jump Street, She has also worked as a co-host on the CBS daytime talk show The Talk. Holly Robinson Peete’s life also seemed interesting enough to warrant the debut in March 2016 of a reality series titled For Peete’s Sake. For Peete’s Sake documents the everyday life of her family. 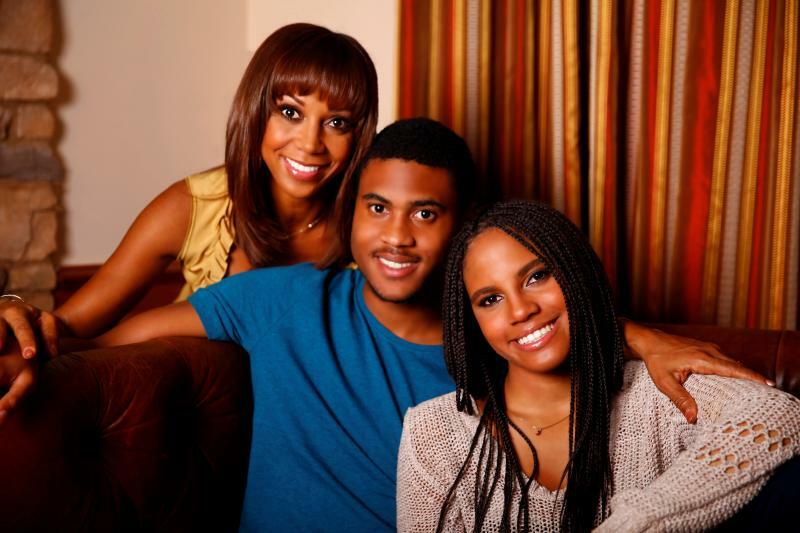 Holly Robinson Peete was born to Matt Robinson and Dolores Robinson in Mount Airy, Philadelphia, Pennsylvania. Dolores Robinson was a school teacher who later morphed into a personal talent manager. Her husband, Matt Robinson, was a producer and writer. The two sent their daughter to the Greene Street Friends School in nearby Germantown. The family later moved to Califonia where Peete ended up graduating from the Santa Monica High School in Santa Monica, California. Her family also gave her the free hand to study abroad for a year at Sorbonne where she sang in Pars nightclubs with a particularly memorable performance with Lionel Hampton at the Hotel Meridian Jazz Club. The couple had a child before Holly Robinson Peete. Peete’s elder brother is named Matthew Thomas Robinson III. Matt Robinson, Holly’s father, has been diagnosed with Parkinson’s disease which led Holly and her husband to found the HollyRod Foundation. The foundation aims to try to find a cure for Parkinson’s disease and Autism and also to help those living with the conditions. Holly Robinson got her extra name when she got married to Rodney Peete on the 10th of June 1995. Her husband is a National Football League quarterback. The loving Mr. Peete actually proposed to his wife during an episode of Hangin’ with Mr Cooper. The lovebirds have four children together. Their twins were born first and named Ryan (daughter) and Rodney Jr. (son). A second son Robinson followed in 2002 and another son Roman was born in 2005. At the age of three years old, Rodney Jr. was diagnosed with autism. Holly Robinson Peete has done well for herself as an actor, author, singer and daily show host. She is said to have a net worth of about $4 million. The bulk of her money came from the activities listed above but Holly also served as the spokesperson for the Nestle brand in 2012 when the brand announced that it had teamed up with her for their Carnation Breakfast Essentials. In 2011 she must also have gotten a good check for hosting the 42nd NAACP Image Awards, alongside Wayne Brady. Her family’s reality series on OWN is also sure to have contributed to her net worth and Holly is happy to channel some of her wealth to her foundation and other philanthropic endeavors.